I guess that's more like nine feet. I’m not a parkour enthusiast, but I am a rock climber, so let me try to answer. Yes, it is possible to do this using only your arms, but it’s hard work and not something you want to be doing very often. Basically you’re looking at a muscle-up followed by a mantleshelf move. Instead, climbers (and, presumably, traceurs) will try to use their feet and the big muscles in their legs. A good climber can push up on ridiculously tiny footholds, even on wildly overhanging terrain. Or, if there’s a positive hold on the ledge and the wall isn’t too polished, they can smear off the wall, pushing their feet out and moving up using friction. Additionally, they can use momentum. I’ve seen traceurs take a running jump at a ledge, grab it and haul themselves over the top by their hands, using momentum to make up the strength deficit. They’re usually also smearing on the wall with their feet. But to me it looks like she’s also using her feet on the vertical part of the ledge, either by standing on a small nub of rock or by using pure friction (“smearing”). That would make it a lot easier! The sideways jump at 1:00 in this video looks rather unrealistic to me, and the drop onto a hard stone floor at 1:40 looks like it would hurt. Also sliding down on your feet like she does at 0:57 looks (a) hard to control, (b) painful. Actually the game agrees– Lara takes some damage at 1:40, as indicated by the appearance of the damage HUD at upper left. I’m pretty sure there is an alternate route. The “dropping and catching herself on a rock ledge five feet further down” at :10 here looks waaaaay hard. I’m not saying it’s impossible, but I’d hate to have to nail a move like that first time when my life depended on it. Also, that’s a lotta stone she’s moving around. Stone is heavy. Nice pendulum at 1:15. Climbers actually do that on big walls in places like Yosemite, though they climb up, carefully place the pivot point, then abseil down to the start of their swing. Do grapnels even work like Lara’s does? I dunno. The jumps all look reasonable, though she’s obviously got a hell of a head for exposure! 1:25: yeah, she’s definitely using her feet to climb up those walls. Impressive speed, though it’s hard to tell how hard the climbing is from this distance. Since there are footholds, I wonder why she didn’t downclimb normally rather than doing that crazy droppy-catchy thing? Or even abseil? Heh, I remember that. She jumps off the ledge and immediately hits the Q button to grapnel the ring. 3:40 She was Thor? Does that explain how she can catch herself by her fingertips after a five-foot drop without rupturing her finger tendons? The superpowers come in (at this point) only when she’s near the blue glowy inscriptions. 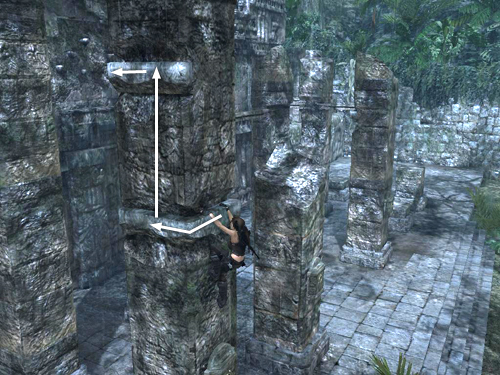 The speed is partly a gameplay thing (games usually have a pretty fast tempo), and partly because the videos are near-perfect replays by someone who knows the map perfectly… when I was playing, of course Lara takes a lot longer to stand or hang there thinking about her next move!